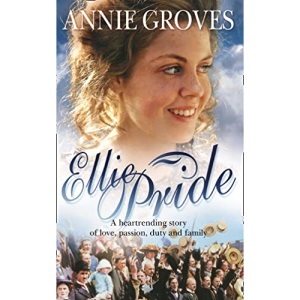 A stunning saga debut from an author destined to be a star of the genre - ELLIE PRIDE is an engrossing, heartrending story of love, passion, duty and family, set in the North-west in the early part of the twentieth century. A stirring, heartrending story of love, passion, duty and family, set in the early years of the 1900s as the First World War looms. After the tragic death of her mother, beautiful, headstrong Ellie Pride must forge her own way in the world. Having made a deathbed promise to her mother to forsake passion for stability and social status, Ellie rejects the advances of local craftsman Gideon Walker, despite her deep attraction to him. With her grieving father struggling to cope, Ellie is exiled to live with her aunt and uncle. Her mother hoped Ellie would be able to escape her humble roots forever. But despite the so-called luxury, Ellie is left frightened and alone. Her uncle quickly reveals a terrifying cruelty that forces her into a loveless marriage in order to escape him. Struggling to support her weak husband against his penny-pinching father, Ellie never forgets her love for Gideon. Their paths are destined to cross again and again. But when events take a tragic turn, Ellie needs all her pride and strength to overcome hardship, and to triumph. A stunning saga debut from an author destined to be a star of the genre -- ELLIE PRIDE is an engrossing, heartrending story of love, passion, duty and family, set in the North-east in the early part of the twentieth century. A stirring tale charting the life of Ellie Pride, a beautiful Preston girl who, when her mother dies, must forge her own way in the world. Warned by her mother on her deathbed to forsake love and passion for stability and social status, Ellie must spurn the advances of handsome Gideon Walker, despite her deep attraction to him. With her father struggling to cope with two children, Ellie is exiled to live with her aunt and uncle in Hoylake. Her mother's dream is that this will give her the chance to escape her background forever. Ellie attempts to get on with her life - but Gideon is never far from her thoughts. Even once she is trapped in a loveless marriage, their paths are destined to cross again and again with far-reaching and devastating consequences. Annie Groves was born and lived in the north-west of England all of her life. She was the author of the Pride family series, Ellie Pride, Connie's Courage and Hettie of Hope Street, for which she drew upon her own family's history, picked up from listening to her grandmother's stories when she was a child. Her next set of novels was the World War II series Goodnight Sweetheart, Some Sunny Day, The Grafton Girls and As Time Goes By. These were followed by the Campion series, Across the Mersey, Daughters of Liverpool, The Heart of the Family, Where the Heart Is and When the Lights Go on Again, which are also based on recollections from members of her family, who come from the city of Liverpool. My Sweet Valentine follows on from Home for Christmas and London Belles and is the third in this series, which introduces a set of glorious characters living in Article Row in Holborn. Annie Groves, whose real name was Penny Halsall, also wrote under the name of Penny Jordan and was an international bestselling author of over 170 novels with sales of over 84 million copies. Sadly, Penny Halsall died in 2011. She left a wonderful legacy of heart-warming novels for many more fans to discover and she will be greatly missed by all who knew her. The final books in the Article Row series, Only a Mother Knows and A Christmas Promise, will be published posthumously in 2013.